GD930 220-230V 50/60HZ INT. GD930 220-230V 50/60HZ INT. 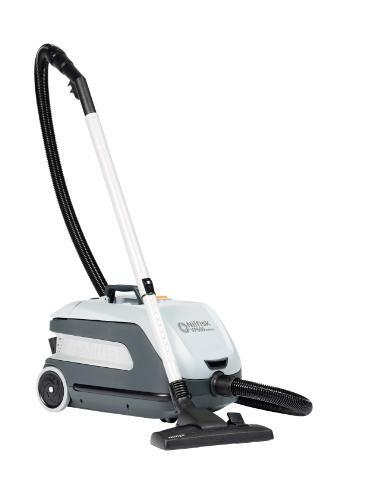 The Nilfisk VP600 Battery vacuum cleaner is a flexible dual-speed machine boosting your productivity - thanks to its cordless mobility and runtime of up to 60 minutes. With a charge time of only 40 minutes the machine offers you non-stop cleaning performance by switching between two 36V Lithium batteries. When you are facing heavy duty tasks and need extra power – just activate the boost function, and the VP600 Battery will match the best mains powered vacuum cleaners. Being easy to move with no need for power outlets – and offering the lowest sound level in its class – you will find the Nilfisk VP600 Battery an attractive choice for trouble free and safe cleaning of busy facilities with many guests and visitors. This makes the machine ideal for applications such as; inside trains, busses, aircraft, shops, fast food restaurants, cinemas, and similar places with seats, tables, and other furniture.